Although born in Lancashire, Sidney Smith Owen served with the Canadian infantry, before joining the Royal Air Force in 1918. He was killed in a flying accident a month after the war had ended. Sidney Smith Owen was born on 8 July 1891 at Litherland, near Liverpool. He was the youngest of three children born to James Leitch Owen (1856–1927) and his wife Sarah Jane née Smith (1856–1941). James, from Tranmere in the Wirral, and Sarah, from Toxteth Park, Liverpool, had married at St Peter’s Church, Everton in December 1877. Their three sons were born after long intervals, with George being born in May 1880, Harold in June 1884 and Sidney in July 1891. At the time of Sidney’s birth, the family were living at 14 Cunard Road, Litherland and his father was employed as a boiler maker. By 1911, James had been promoted to foreman and the family had moved about 1½ miles south to a larger house at 20 Merton Grove, Bootle. Sidney was now employed as an apprentice (commercial). Sidney was educated at Hawthorne Road School in Bootle, and then at Bootle Boys Secondary School, and attended Christ Church in Breeze Hill, Bootle, less than half a mile from their home at Merton Grove. He was employed by Guest, Keen and Nettlefolds of Liverpool. 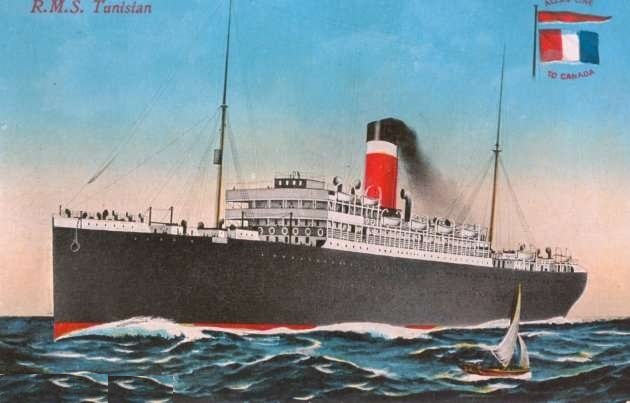 On 12 July 1912, Sidney embarked aboard the Allan Line steamship RMS Tunisian en route to a new life in Canada. The Tunisian had been built in 1900 with accommodation for 240 first class, 220 second class and 1,000 third class passengers, and travelled regularly between Liverpool and Quebec & Montreal. On 10 April 1912, she had been sailing between New Brunswick and Liverpool when she encountered heavy ice – a few days later, this ice was to claim the RMS Titanic and the lives of over 1,500 of its passengers and crew. The Tunisian reached Quebec safely, and Sidney disembarked on 21 July. Although it appears that Sidney planned to seek work at Winnipeg as a ranch hand, he eventually travelled to the far west of Canada and settled in British Columbia, where he found employment as a clerk working for the Granby Consolidated Mining, Smelting and Power Company at their Phoenix Mine. On 10 April 1917, Wor. Bro. W.H. Begbie proposed Sidney as a candidate for initiation into Derwent Lodge No 40 at St Leonards near Hastings in Sussex. Wor. Bro. William Henry Begbie (1856–1937) was an agent for the Globe Express Parcel Company and had served the lodge as Worshipful Master in 1915. The proposal was seconded by the lodge treasurer, Wor. Bro. H.C. Edwards. Sidney Owen was one of seven Canadian soldiers initiated into Derwent Lodge during 1917. On 14 May, he was balloted for successfully, following which the Worshipful Master, Wor. Bro. G.F. Miller vacated the chair in favour of Wor. Bro. Begbie who initiated Sidney Owen. The charge after initiation was rendered by Wor. Bro. L.T. Weston. On that same evening, two brethren were passed to the second degree and four others were raised to the degree of a Master Mason. It must have been a long evening! Sidney Owen was passed to the second degree at an emergency lodge meeting on 11 June 1917, and raised to the third degree at another emergency meeting four weeks later. On 10 December 1917, the lodge received a letter from Bro. Owen giving his apologies and enclosing 20 shillings for the broken column. Sidney enlisted at Victoria, British Columbia, on 13 February 1915, joining the 30th Battalion of the Canadian Infantry (Canadian Expeditionary Force) as Private No 77966. On his attestation papers, he stated that he had previously served in the Royal Navy Volunteer Reserve in England, and in the 88th Volunteer Force in Canada. The 30th Battalion embarked for Britain on 23 February 1915 and spent the summer of 1915 in training at Shorncliffe on the Kent coast. The battalion were kept in reserve, and used to provide reinforcements for the Canadian Corps in the field. In January 1917, its personnel were absorbed by the 1st Reserve Battalion, CEF. Sidney Owen was wounded in the Third Battle of Ypres (also known as the Battle of Passchendaele) in the autumn of 1917. Following his recovery from his injuries, he rejoined his battalion at the front. In March 1918, he was transferred to the Royal Air Force as a cadet. He spent the summer of 1918 training at Reading and Winchester and on 28 September he was commissioned as an honorary lieutenant. On 23 October, he went to France and was assigned to the 42nd Squadron of the Royal Air Force. The 42nd Squadron was engaged in flying reconnaissance sorties, using Royal Aircraft Factory R.E.8 two-seater biplanes. Known colloquially as the “Harry Tate”, after a popular music hall performer, the R.E.8 was an unreliable aircraft and, having been introduced in 1916, by 1918 it was becoming obsolete – some pilots considered it to be a “death trap”, although it could be flown safely by an experienced pilot. On 11 December 1918, a month after the Armistice, Lieutenant Sidney Owen and his observer, a fellow Canadian, 2nd Lieutenant William Dixon Wicks (aged 29) were flying R.E.8 No B5041 from an airstrip at Aulnoye (now Aulnoy-lez-Valenciennes) in Eastern France, to transfer it to a new airfield closer to England. Shortly after take-off, the plane got into difficulties and crashed in flames, killing both pilots. The two pilots were buried the following day alongside each other in St Roch Communal Cemetery in Valenciennes. A report of his death was published in the Bootle Times on 20 December 1918, accompanied by a notice from his family. The family published notices on the anniversary of his death in 1919 and 1920. OWEN – In loving memory of our darling son, Sidney Smith, 1st. Lieut., Pilot, 1st British Columbia Regiment, attached Royal Air Force, killed in France Dec. 11th, 1918. “Father in Thy gracious keeping, leave we now our loved one sleeping.” – His sorrowing Mother and Father, Merton-grove, Bootle. As well as on the Masonic Roll of Honour, Sidney Owen is commemorated on memorials in both of his former schools and in Christ Church, Bootle and on the Bootle Civic War Memorial. He is also commemorated on the war memorial tablet set above the secretaries’ desk within the temple in the St Leonards Masonic Hall. Sidney’s elder brother, George Leitch Owen, also served in the war, as a bombardier with the Royal Field Artillery. George died in July 1932, aged 52, while his other brother Harold lived to 87, dying in 1971. With special thanks to Wor. Bro. Terry Mahoney for the extracts from the Minute Books and records of Derwent Lodge No 40. RAF Museum Casualty cards: Owen, S.S.